Herbert K. Savage was a famed writer for Field & Stream in the early 1900s. 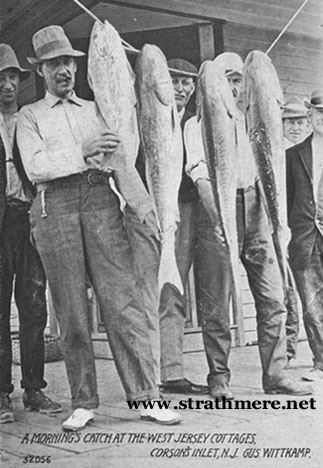 He wrote about fishing and hunting on Corson's Inlet on many occasions and stayed at the West Jersey Cottages. He married Bess Moore whose father William B. Moore owned a house in Strathmere and a dry goods business in Philadelphia. Mr. Moore ran a program that consisted of bringing inner city poor to Strathmere for a few days in the Summer. Herbert Savage and his wife Bessie had a daughter Jane, who spent many years coming to Strathmere. The photos below are from her estate, courtesy of her son-in-law. 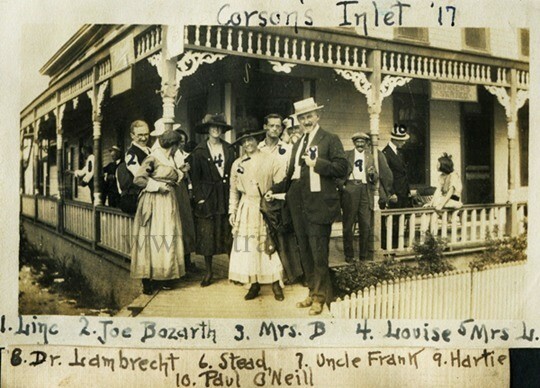 This photo is in front of the Moore Cottage. That's Bertha Wittkamp 2nd from left in back row. William B. Moore front and center and Bess Moore at right 2nd row. 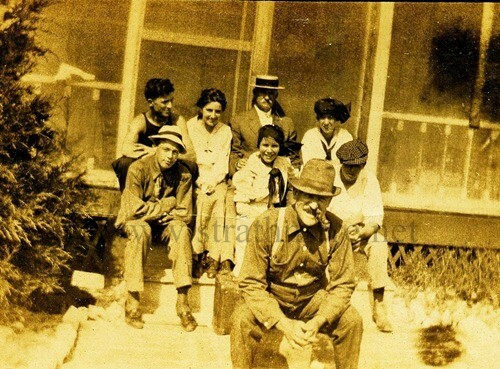 This photo was taken in front of the West Jersey Cottage and dated 1917. 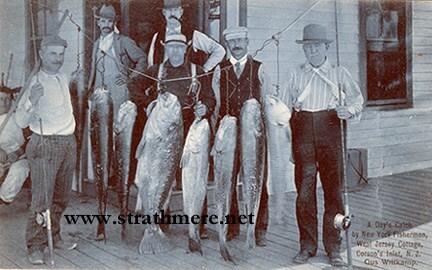 Link Roden, Joe Bozarth, Stead Applegate, Hartie Phillips and Paul O'Neill were fishermen who were friends of Herbert K. Savage and they are each mentioned in some of his Field & Stream fishing and hunting stories. 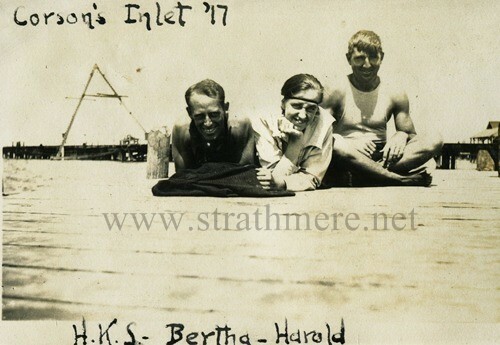 This photo is on the bay beach near the railroad bridge - Herbert K. Savage, Bertha Wittkamp and Harold. 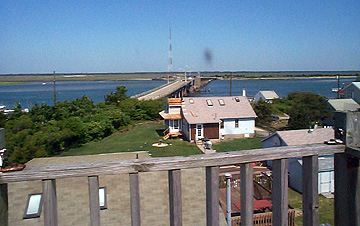 A view of the West Jersey Cottage from the bay. 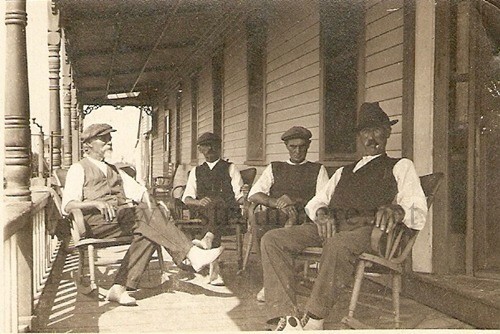 Fishermen on the porch of the West Jersey Cottage with proprietor Gus Wittkamp second from left. 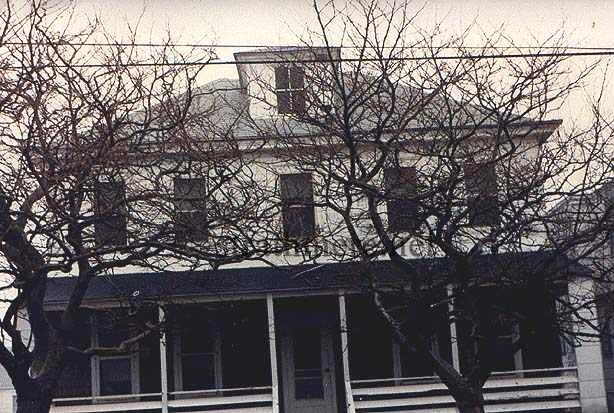 A side view of the West Jersey Cottage when it was on Winthrop, with our house next to it. 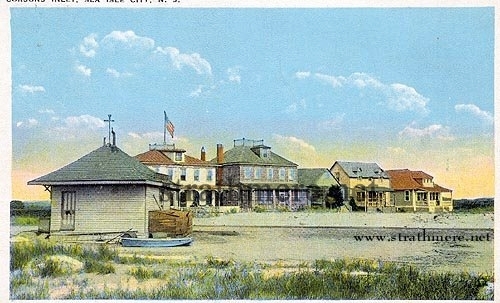 Postmarked 1921. 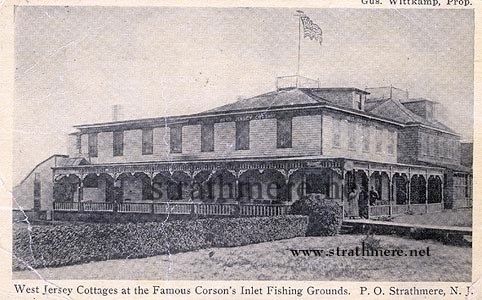 The front mentions the Famous Corson's Inlet Fishing Grounds. A view of Winthrop and the West Jersey Railroad train station. The station use to be where the car bridge is now. 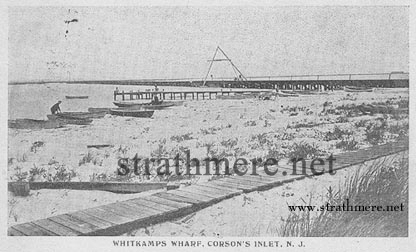 Whitkamp's Wharf, Corson's Inlet NJ. Post marked 1908. 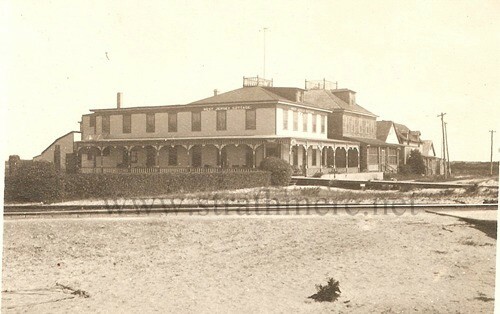 This is a view of the beach on the bay in front of where the West Jersey Cottage and the West Jersey Railroad station was located. That's the railway bridge in the background. The name should actually be Wittkamp. Carrie Wittkamp died in 1930, and Gus died in 1935. They left the Hotel to their children Bertha & Harlan. 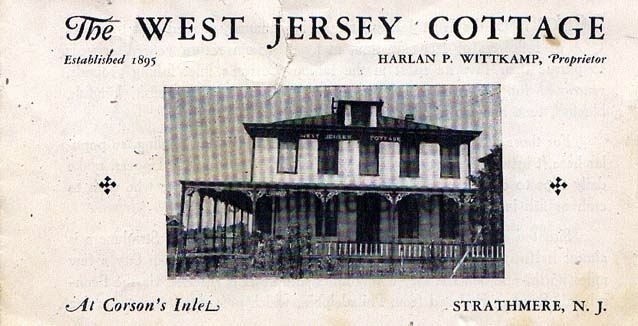 Harlan took over as manager of the hotel until 1944. To the left is an old brochure for the hotel from the late 1930's when it was managed by Harlan. In 1944 a terrible hurricane blew through the Jersey coast. The damage that was done to the hotel was more than what the Wittkamps could afford to repair. They sold what could be salvaged from the main hotel building, and it was moved down the road to the main intersection. That part of the hotel was rebuilt by new owners at it's new location. It has seen many transformations since then, from Ernie's Gas & Food to a deli, to it's current use as an Italian Restaraunt. 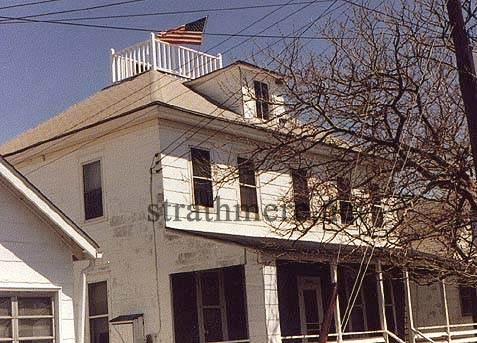 The annex of the West Jersey Cottages has remained intact and Bertha lived in the annex with her half-sister Estelle, who was a widow, and I believe she was ill or disabled too. The annex had been converted into 2 apartments. They lived on one floor, and continued to rent out the other floor. After Estelle died, Bertha moved into the tiny boathouse behind the annex. It had been turned into an efficiency cottage. 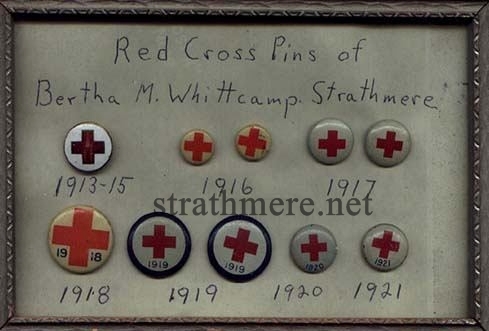 Bertha was a Red Cross nurse (see her Red Cross buttons on the right) She never married and she happily lived her entire life on the island. Harlan married and moved just up the road. He worked as a toll taker on the bridge and his wife was the postmaster for the town. In 1982, Bertha decided to sell the annex of the West Jersey Cottage, that's where we come into the story. 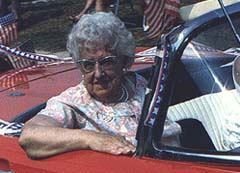 We met 81 years old Bertha over breakfast at the Deauville Inn, on a Sunday morning in March, 1982. She didn't want to leave her home, so she requested that she be allowed to continue to live in the tiny cottage. The deal was made! Bertha lived the rest of her life, on the island that she loved, with townspeople who adored her. She was featured in the annual Strathmere 4th of July Parade as the first baby born in Strathmere. The photo on the left is a parade photo from the 1980's. And lucky us, we got a great house! The house will be 100 years old this year. It was a rainy day in March 1982, when our friend Lynda, from the Deauville Inn, took us through the house. Below on the left, is a photo taken on that day when we saw the house for the first time.On the right is a photo take in May, after we bought the house. We rebuilt the 'Widow's Peak' on the roof. It had long been gone, and the top opening had been sealed up. Attic Treasures - After buying our house, we found some old long-lost treasures under the floorboards in the attic. 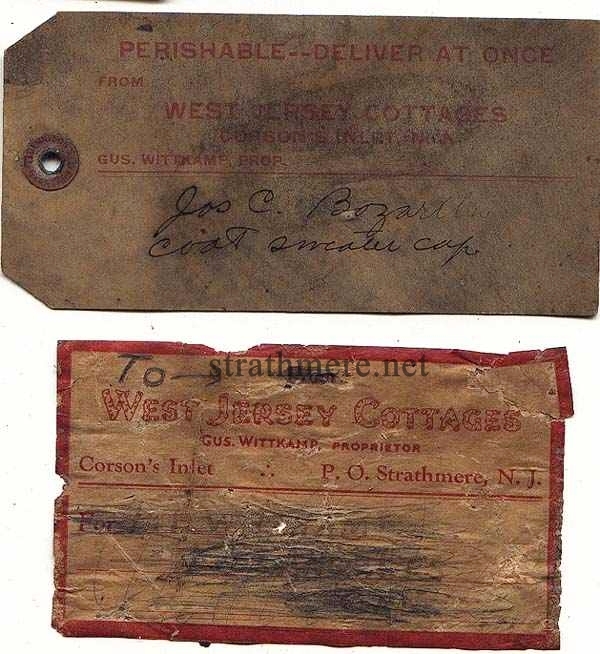 On the left, is an old matchbook cover with advertising for the West Jersey Cottages. Above is an old business card. Most of the face of the card has been nibbled away by mice and by time. But part of the name and a little of the photo still show. 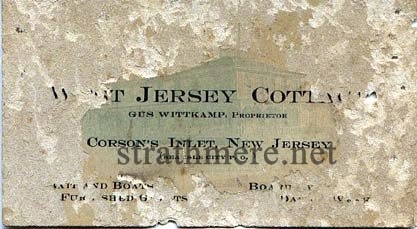 To the left - is an old tag and label from old suitcases or steamer trunks. Both have the West Jersey logo on them. On the right - Not actually a found item, this was a bought item. 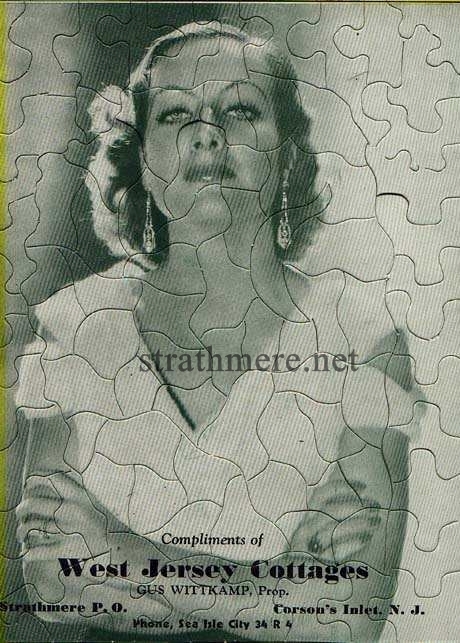 It is a give-away promotional puzzle for West Jersey Cottages, featuring the image of a young Joan Crawford. 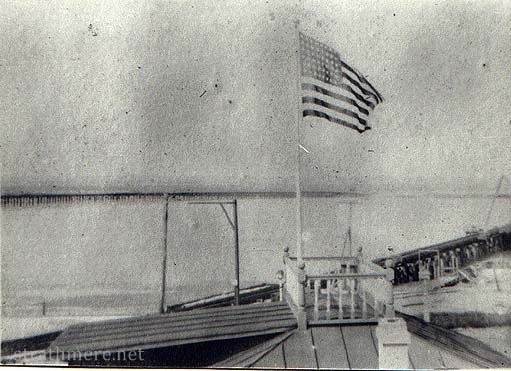 The view of the bay and the flag on top of the hotel, from the roof of the West Jersey Annex in the early 1900's. The picture on the right is the view in the early 2000s. Three other homes now stand where the hotel once was.